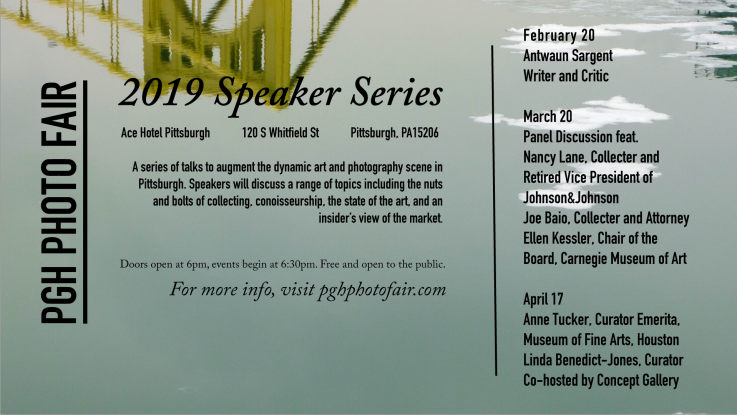 We are pleased to announce the return of the PGH Photo Fair Speaker Series. This free lecture series takes place once a month at the Ace Hotel, leading up to the PGH Photo Fair at the Carnegie Museum this spring on April 27th and 28th. Whether you’re a collector, a photography enthusiast, or just a fan of Instagram – PGH Photo Fair Speaker Series will have something to offer that you won’t find anywhere else in town. The series features speakers who will focus on the nuts and bolts of collecting, the state of the art, and an insider’s view of the market. April 17th Speakers: Anne Tucker in conversation with Linda Benedict-Jones. Anne Wilkes Tucker is the curator emerita of the Museum of Fine Arts, Houston, having, in 1976, become founding curator of the photography department for which she acquired over 30,000 photographs made on all seven continents. She curated or co-curated over 40 exhibitions, most with accompanying catalogues, including surveys on the Czech Avant-garde, a history of Japanese photography, and a history of war photography as well as exhibitions with catalogues on works of Robert Frank, Brassai, Catherine Wagner, Joel Sternfeld, Richard Misrach, Ray Metzker, Louis Faurer, George Krause, and Chen Changfan. Published and soon-to-be published interviews with photographers include Erika Diettes, Mark Klett, and Brad Temkin. She has also contributed articles to over 150 magazines, books and other catalogues and has lectured throughout the North and South America, Europe, Africa, and Asia. Her honors, fellowships, and awards include being selected as “American’s Best Curator” by Time Magazine in 2001 in an issue devoted to America’s Best as well as Randolph-Macon Woman’s College’s, Alumnae Achievement Award in 1993. She has been a trustee of FotoFest since 1990 and the Philip and Edith Leonian Foundation since 2016 and served as a trustee of Randolph College between 2008 – 2018. Next PostAbsolutely Not (Chicago) / T-Tops / Late.